If you work Monday through Friday, Saturday’s & Sunday’s are sacred days. I cherish every minute of those two days because it’s the time I get to spend with family and friends. Ever since college, I have spent the majority of my Saturday’s shopping and dining with my best friend, Alyssa. From engagements to weddings to vacations to work – we schedule Saturday’s to spend quality time together. It allows us to catch up on the week, do what we love (shop) and enjoy a nice glass of bubbly over lunch(!!). Here’s a breakdown of my bestie and I’s date last Saturday. I met Alyssa at her house and we headed to South Center mall. We usually go to Bellevue Square but thought we’d change it up this time and head to another mall. On our way there, we usually discuss what we want/need to buy. And let’s be honest – we buy more of what we want than we need. (don’t tell our husbands!) Once we arrive at the mall, we hit up the handful of stores we love – Nordstrom, Macy’, Forever 21, Francesca’s, and H&M. This trip, we started at Nordstrom, walked through the jewelry and cosmetic area and sprayed some perfume (you always must spray perfume). Then I noticed some really cute Printed Village tattoos on sale (1/2 off!) during the Nordstrom Half-Yearly so picked up a pack of these and we were off to the next store. We headed over to Macy’s because I wanted to buy some white converse for summer. I’ve been seeing such cute summer outfits with converse as the shoe choice that I had to do it. So, we walked into Macy’s, purchased the shoes, and off we went. Quick side note – Alyssa and I don’t mess around when we shop. We walk in, get what we need, and we’re out. Boom, boom, bam! Ok, moving on…After Macy’s we headed to Francesca’s. Bellevue Square doesn’t have a Francesca’s, so when we go to South Center, we always make it a priority to go there. Alyssa found a really cute romper for summer and we purchased some sunglasses cause they are extremely reasonable and adorable. Plus they were buy 1, get one 1/2 off. Um…yes please. Following Francesca’s, we were hungry! Our go-to place for lunch is the Nordstrom Cafe. We hopped on over to Nordstrom and enjoyed our chicken, apple, and goat cheese salad with an ice cold diet coke. I love this part of the day because we can talk, catch up on our week, and enjoy each other. If we were at Bellevue Square, we would’ve gone to the Nordstrom Habitant lounge. They have bomb cilantro lime chicken tacos for $8.25! You have to try them. Once we finished lunch, we headed over to H&M. Alyssa found an adorable crop top that will be perfect for summer. She looks fab in crop tops so excited to see how she pairs it with pants or a skirt. Ok – at this point, we’ve been at the mall for a few hours and were ready to head out! 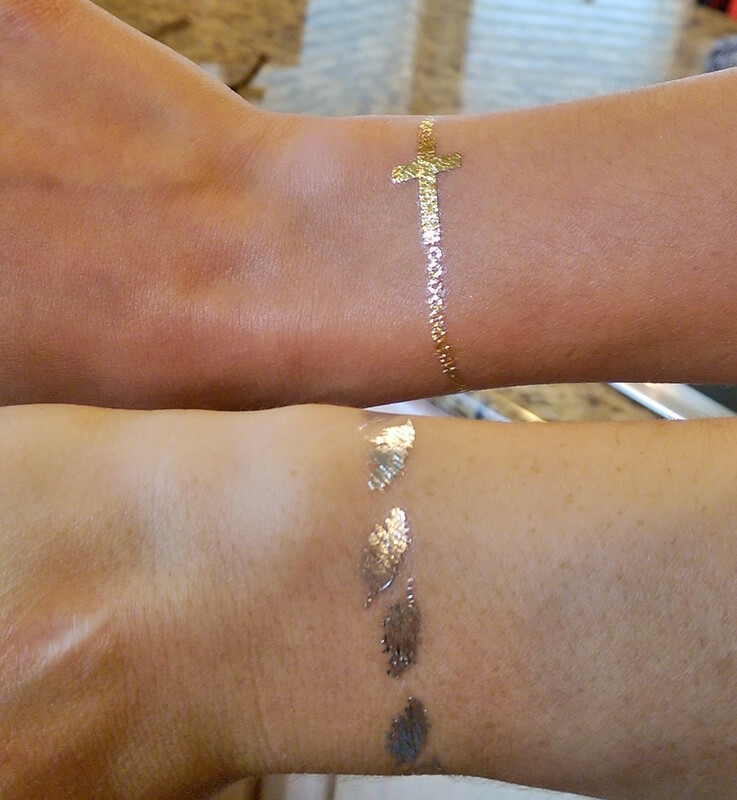 We went back to her house and tried out some of my new tattoos. Take a look. They are super cute! To check out more Saturday fun with my best friend, head over to my @lauren_husum! We’re all busy and have lots going on, but I cherish those Saturday’s with Alyssa. Neither of us have kids yet so having free time on a Saturday to spend the day together is a treat. Take a minute, schedule a day date with your bestie at your local mall, do some shopping, and enjoy time with them. It’ll mean a lot. I promise.